Daily Illuminator: #PlayMunchkin With Moop At Your Local Store Today! 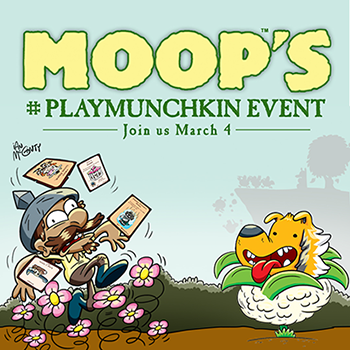 March 4, 2017: #PlayMunchkin With Moop At Your Local Store Today! Make many memories with Moop's Monster Mashup m-oday. . . I mean, today! We have stocked nearly 200 friendly local game stores with our Moop's Monstrous Mailer, filled with unique goodies like promo cards and bookmarks. So, swing on by to meet some fellow munchkins, play some great games, and, best of all, get free loot! Check out our list of participating retailers and go by today. Don't forget to tag your store and share pictures from your local event with the hashtag #PlayMunchkin on Twitter, Facebook, and Instagram! Not only will we share them, you'll be entered to win Munchkin prizes the following Monday. #PlayMunchkin is the gift that keeps on giving! Show us your wacky mashups, and maybe you can mix your Moop with some other sets (here's a suggestion)! We look forward to all your wacky pictures and updates!